Does business oppose congestion charging? I’m very disappointed with the line one of the State’s largest employer associations, VECCI, is taking on road congestion charging. This issue was raised in a report prepared by consultants Acil Tasman for the Competition Commission’s (VCEC) inquiry into a State-based reform agenda. Congestion imposes such a high cost on business – whether freight or personal business travel – that I’d expect the great majority of VECCI’s members would be better off with pricing. The Bureau of Infrastructure, Transport and Regional Economics puts the current cost of congestion in Melbourne at around $3 billion per year, rising to $6.1 billion by 2020 with unchanged policies. VECCI says it is opposes the idea of congestion charging for three reasons. First, motorists already pay both the CBD Congestion Levy and the fuel excise. Second, there’s no spare capacity in the public transport system to take displaced motorists. Third, the economy can’t handle another tax on top of the forthcoming mining tax and the carbon price. In regard to VECCI’s first objection, the obvious point is that these existing imposts on motorists aren’t working – many Melbourne roads are still congested at peak times. Despite the lofty title, the CBD Congestion Levy is actually a tax on parking. It’s only had a very minor impact on traffic because most drivers don’t pay it personally – their employers do. It isn’t in any event peak-loaded and of course it does nothing to manage the level of through traffic. And as per the name, the levy only applies to the CBD. The $0.38 fuel excise tax (no longer indexed) does reduce the overall level of travel by motorists, but has no appreciable effect on congestion because it doesn’t vary with the level of traffic or time of day. So far as the “no spare capacity on public transport” objection is concerned, a congestion price only has to remove a relatively small number of vehicles in order to get traffic moving at an acceptable speed. The vast majority of motorists won’t come seeking a seat on the train – they will continue to drive but, rather than pay with time as they do at present under congested conditions, they’ll pay in cash. Their numbers may increase over time, but so will public transport capacity. 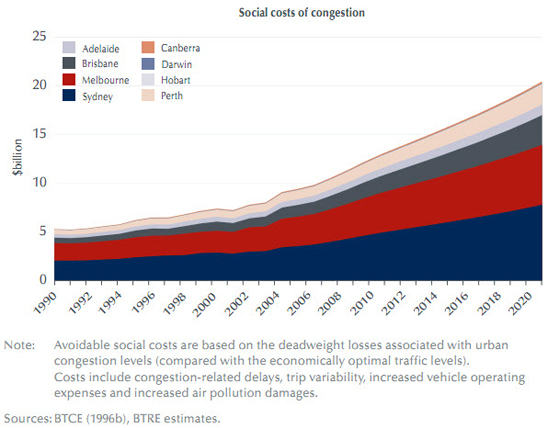 Also, revenue from congestion charging should be applied to improving public transport and increasing capacity. VECCI’s argument that the economy can’t handle another tax is about as nakedly political as you can get. Australia is one of the world’s most vibrant economies and has been growing for 20 years. Motorists, both business and private, can afford to pay their way. In any event, a congestion charge isn’t a tax — as the name says, it’s actually a charge. Motorists pay directly for the quantity of road space they use and get a direct and immediate benefit – faster travel. That means motorists who travel more pay more. It also benefits drivers from all income strata by enabling them to reduce delays when they make high value trips. I know VECCI’s a broad church – it has a diverse membership – but it’s a bit stunning when a policy that would lower the cost of doing business in Melbourne is opposed by business. In fact it beggars belief. Business should be insisting on congestion pricing and leaving the Government to sort out the politics. However lame VECCI’s arguments are, they highlight the key challenge with congestion pricing – the problem isn’t establishing that it’s a good idea, it’s selling it politically. For example, the Victorian Government’s immediate response to the Competition Commission’s report was to issue a statement saying it isn’t considering congestion pricing. It’s vital the option be kept ‘live’ for when conditions are more favourable. In the meantime we’ll continue to suffer the costs of traffic congestion and pay well over the odds for other solutions that aren’t anywhere near as cost-effective and provide much lower benefits. We have the technology to implement comprehensive metropolitan-wide congestion pricing but the politics would be very hard in the short term. Robert Doyle’s problems with tolls on EastLink when he was Opposition Leader indicate how fraught the issue of pricing can be. In the first instance, it would be easier to pursue a “second best” scheme in the CBD modelled after a cordon like London’s, with revenue ploughed back into public transport and city centre amenity improvements. The CBD already has excellent public transport and few people are going to worry about the equity implications of executives paying substantially more to drive to work.